Chocolate, cinnamon and butter sounds decadent. And scones are more practical than my fancy Irish shamrocks with royal icing. But I do wonder if there is a parve scone option – or is that a contradiction in terms? clearly taste buds run in the family! I think it’s the butter that makes these really decadent, especially since I made these with skim milk. The chips are kept to a minimum and the cinnamon just gives a little extra flavor that permeates but does not overwhelm. I, like you, am always interested in trying to make parve/non-dairy options. This one might need to be relegated to the breakfast/brunch table because the texture is pretty nice and too much messing could be dangerous. BUT, if you want to experiment with me — here are my thoughts — good margarine (”earth balance” is what I’ve found here in Cambridge and it’s better than Fleishman’s) and maybe a soy milk or rice milk (not vanilla). I made Irish soda bread with Friendship buttermilk on St.Patricks day. Added additional sugar because DH thought it wasnt sweet enough. Terrific recipe on the container. While I’m not an Irish Jew, I sort of am – I live in Ireland with my Dublin-born hubby, and I’m Jewish (he’s not, though he loves my kasha varnishkes and Sephardic borekas, so there’s hope for him yet, LOL). You’re right – it’s a bit of a problem finding Irish-Jewish recipes, and even though there were a few Lord Mayors of Dublin that were Jewish, and a former President of Ireland was born in Israel and was Jewish, and there’s a Jewish Museum in Dublin (excellent, by the way), there are sadly very few Jews living in Ireland any longer, and there are only three synagogues (that I know of, anyway) still in existence. As you’d correctly stated, it’s sad that even Dublin’s Little Jerusalem (mostly Clanbrassil Street) that once had cafes and bagel shops and kosher butchers, don’t even have Bretzel’s as a proper kosher noshery any longer. I’ve been to Bretzel’s, and it’s okay – the bagels and the bialys are okay (or as Molly O’Neill once referred to them, baileys) – but it’s just not the same once you know and realise that it’s no longer even Jewish owned). The scones recipe you got/adopted from Molly O’Neill’s book is excellent (especially for me, as a born-and-bred New Yorker), but, as you’ve said yourself, it’s a Scottish recipe, which is similar but ever-so-slightly different to the traditional Irish recipe. If you’d like the Irish variation on the theme, or if anyone of your readers would like it, I’d be happy to post it. In the meantime, I’ll keep checking out the bookshops in Dublin next time we visit (we’re on the other side of the country, on the west coast) and try to find an Irish-Jewish cookbook…somewhere, someone must have done a cookbook on this subject. I mean, if I can find the amazing ‘Cookbook of the Jews of Greece’ on ebay (an amazing, beautiful cookbook, might I add), then there’s just gotta be an Irish Jewish cookbook, right? Thanks for all the info on Jewish Ireland. 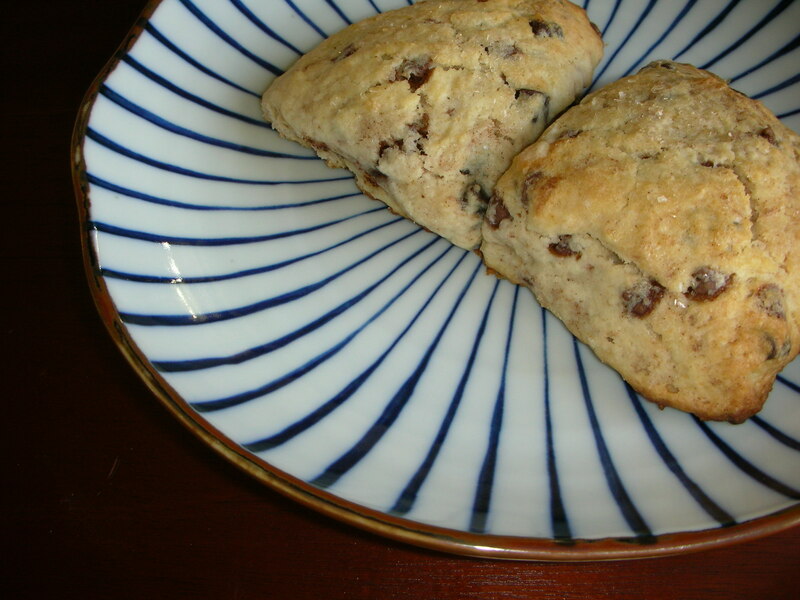 I would love to get your Irish take on scones. Ironically, I have “Cookbook of the Jews of Greece” that I bought at the Athens Jewish Museum before an island hopping tour. You’ve inspired me to flip through it again – it has some great fish recipes! Set oven to 425 F or Gas Mark 7. In a bowl, sift together all the dry ingredients (except for the sugar). Rub in the butter wtih your fingertips until the mixture resembles breadcrumbs. Now add in the sugar, the dried fruit and mixed fruit peel, combining them all with a knife, and then add buttermilk as you go along, bit by bit, stirring with the knife, until you feel you have a soft dough. Turn out onto a large surface, sprinkled with more flour, and divide into 2 inch rounds, each about 1/2 inch thick. Place on a baking sheet (lightly greased with butter) and glaze with a little more buttermilk or a beaten egg, if you prefer a more shiny coating. Bake for about 10 minutes, until well risen and golden. You can also make this recipe as a ‘scone cake’ – just pour mixture into a large round tin, and bake for 25 minutes instead of ten. apple cinnamon spice scones…even potato scones (potatoes are still the staple of Irish food – especially in the west), but this is the recipe I find myself returning to each time, and usually comes out resembling the traditional Irish scones that the women of long-ago Ireland would hopefully approve of if they tasted mine. How cool that you also have the ‘Cookbook of the Jews of Greece.’ It’s a wonderful book – I think the illustrations are stunning, as is the way the book is written – not just the recipes, but the stories and history and regional references that accompany each recipe. I’m so glad I finally found this book – at an affordable price (long live ebay!). Hope you found ‘my’ recipe (not mine really, but the standard traditional way of making scones, adopted and adapted by me) helpful. Thanks for allowing me the space for such a long comment. I’m happy to share. I’ve only just found your blog and I think it’s lovely and beautifully designed and written. Oh yeah…I also have a recipe (or two) for Irish soda bread, if you or any of your readers are interested. Let me know.